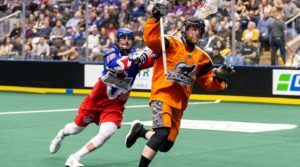 The Toronto Rock (11-6) hosted the New England Black Wolves (8-8) on a special night at Scotiabank Arena as the Rock retired Jim “Scoop” Veltman’s #32 jersey lifting it to the rafters to reside along two other Rock, greats Bob Watson and Colin Doyle. Veltman who played for the Rock for nine years; winning five Championships; and even though he retired 11 years ago, still holds the NLL record for most loose balls in a career with 209. In a classy move the New England Black Wolves team were seated on their bench for the ceremony and Jim thanked their organization for giving him his first chance at a coaching position. Final Score: Toronto 13—New England 12. Once the festivities had been completed, it took a few shifts for the teams to get their legs under them and it was the Black Wolves scoring first. Stephan Leblanc (2G, 6A) would cut across the center of the floor and take a sidearm shot to beat Nick Rose (1A, 35 saves) through the legs to give New England a 1-0 lead. A minute later the Rock answered back as Rose made a nice outlet pass to Damon Edwards (1G, 1A), who went down the floor on a two on one beating Doug Jamieson (37 saves) with a low shot to tie it up at one. The Rock would take the ensuing faceoff, head down the floor and Tom Schreiber (2G, 4A) made a nice flip pass as he was heading behind the net to Dan Lintner (2G, 3A) who deposited it over Jamieson’s shoulder. The Rock continued the scoring run as Challen Rogers (1G, 1A) all alone on transition beat his defender with a nice dodge fooled Jamieson up high giving Toronto a 3-1 lead. The teams went over five minutes without scoring until New England’s Colton Watkinson (1G) got the breakaway and as Edwards caught him it took him down resulting in a penalty shot. Callum Crawford (2G, 2A) would take the shot and beat Rose short side to cut the lead to one. The Black Wolves would tie it up as Leblanc fed a cutting Tyler Digby (2G) who beat Rose over the shoulder. The Rock came right back a minute later when Adam Jones (1G, 3A) took a feed from Dan Craig (2G, 1A) and put an overhand shot into the bottom corner. With the last possession of the quarter New England would pull their net-minder for the extra attacker, Leblanc made the pass from behind the net to Reilly O’Connor (2G, 1A) who dove in front beating Rose far side and tied the game at four with less than five seconds left in the quarter. Shots on goal at the end of the first quarter favored New England 14 to Toronto 7. The Black Wolves would continue their run from the end of the first scoring the first goal of the second quarter. On a bad change by the Rock, the New England transition ended up with a three man break away and Watkinson would beat Rose to the short side giving the Black Wolves the lead 5–4. Four minutes later, Toronto would come back to tie the game again on a delayed penalty, the goalie pulled and Rob Hellyer (3G, 1A) moved in from the left side to beat Jamieson with a bounce shot. The Black Wolves got that one right back less than 30 seconds later as Leblanc took a pass down low, tip toed around the crease to beat Rose to the glove hand side. After a lengthy review, the goal was counted and the one goal lead was restored. The Black Wolves would double their lead as Crawford drew both defensemen down low and flipped it back to Joe Resetarits (2G, 1A) who beat Rose with a bounce shot through the legs, the Rock now trailed 7–5. The final goal of the first half went to the Rock as Hellyer picked up a loose ball and took a low to high shot to pick the top corner on Jamieson cutting the lead to one. Shots on goal at the end of the first half still favored New England 28-22. Score at the end of two: New England 7—Toronto 6. The game of lacrosse runs on momentum and the Rock had it going into the second half. It started with Craig and a nice overhand shot beating Jamieson short side for a short-handed goal tying the game at seven. Less than the 20 seconds later Hellyer came off a pick and beat Jamieson far side with a nice hard shot to get his hat trick and give the Rock an 8-7 lead. Schreiber would extend the Rock lead to 9-7 as he picked up his own rebound off the back boards and beat Jamieson low stick side. New England would stop the run with a goal when Digby took a shot as he was falling backwards and it beat Rose low to make it a one goal game again. Johnny Powless (1G, 2A) would restore the two goal lead for Toronto when he received a hard cross crease pass from Schreiber and put it in the open net behind Jamieson. On the man-up for the Black Wolves, Crawford scored on a power play with a long bounce shot beating Rose glove side getting them back to within one goal at 10–9. As had happened several times earlier, New England would tie the game with less than three minutes left in the frame when Leblanc made a nice pass to a cutting O’Connor who beat Rose through the legs tying the game at 10 apiece. With the last possession of the third, and the power play the Rock would pull Rose for the six on four. Schreiber took the pass and made a nice over hand bounce shot between Jamieson’s legs with less than a second left to give Toronto an 11–10 lead at the end of the third quarter. Toronto was closing in on shots on goal with New England still holding a one shot lead 37—36. Again the momentum helped Toronto going into the fourth quarter when Schreiber made a beautiful behind the back pass to Lintner for a quick stick into the top corner increase the lead to 12–10. Dan Craig would increase the Rock lead to three when he received a nice pass from Lintner from behind the net and beat Jamieson. Derek Downs (1G) stopped the Rock run when he scored for New England on a low hard shot that beat Rose through the legs to make it 13–11 for the Rock. The Black Wolves weren’t ready to throw in the towel and Resetarits would cut the lead to one with a great outside shot that beat Rose to the outside. Once more, New England would pull their goalie for the extra attacker in the last minute, had some good ball movement but Damon Edwards soaked an outside shot and the Rock recovered the ball to preserve the 13–12 win. After the final whistle and as all of the players came on the floor there was some pushing and shoving. Billy Hostrawser (2A) squared off with Andrew Suitor in a lively bout; and with all the players on the floor this could have had a negative outcome. There were attempts to get Callum Crawford into a fight as payback for the hit on Brad Kri earlier in the season, but both sets of coaches pulled them apart and defused the situation. 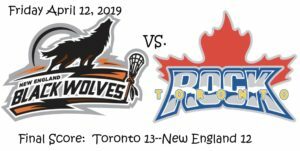 The Toronto Rock (11-6) play next on April 26th at 10pm as they visit the Vancouver Warriors(4-11) while the New England Black Wolves (8-8) visit the Buffalo Bandits (12-4) on April 20th at 7:30pm.